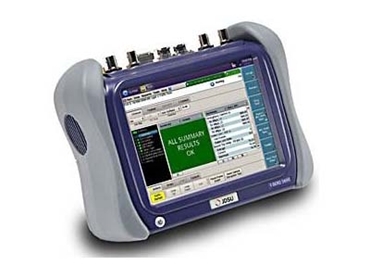 Measurement Rentals introduces the Viavi (formally JDSU) MTS-5800 10/100/1000/10G Ethernet network testers to their extensive test and measurement rental fleet. The ViaviMTS-5800 family consists of high-performance, dual port, handheld network testers designed for the installation and troubleshooting of Ethernet networks over copper and fibre. The compact-sized Viavi MTS-5822P handheld network tester addresses the challenges of carrier Ethernet evolution, supporting both legacy and emerging technologies required to handle various network applications including metro/core, mobile backhaul, and business services installations. The handheld instrument supports testing throughout the entire service lifecycle, including service activation, troubleshooting and maintenance, and guides field technicians through troubleshooting without any need to carry a separate analyser instrument. Key features and capabilities of the Viavi MTS-5822P Ethernet network testers include ability to test and troubleshoot converged Ethernet/IP networks at 10 Mbps, 100 Mbps, GigE and 10GE interfaces; testing of Layer 1-3 Ethernet/IP SLAs with an automated, enhanced RFC 2544/SAMComplete per ITU-T Y.1564; industry’s smallest integrated J-Complete functionality, such as capture/decode and automated J-Mentor; and successful mobile backhaul transitions ensured by validating both Ethernet backhaul synchronisation (1588v2 and SyncE) and front haul (CPRI/OBSAI) BER and delay to guarantee successful mobile handoff between cell sites, thereby avoiding service degradation. The Viavi MTS-5822P also features a fully-loaded TDM/PDh to dual 10 G Ethernet, SONET, SDH, Fibre Channel, and OTN support with automated, enhanced RFC 2544 and SAMComplete testing per ITU-T Y.1564. With integrated burst testing approach per MEF 34 and RFC 6349 TrueSpeed TCP throughput testing and Integrated Timing/ Synchronisation testing including PTP/1588v2, SyncE, Wander, and One Way Delay test, this instrument is designed for simple operation. Additionally, features such as a dual-port handheld platform, large 7-inch touch screen display, Wi-Fi, and Bluetooth interfaces make the MTS-5800 a reliable tool. It’s also equipped with automated test and data reporting capability and an integrated web browser. Measurement Rentals also offers AC power analysers, DC power supplies, RF power meters, RF spectrum analysers, RF network analysers, digital oscilloscopes (CRO), data acquisition, telecommunications and data communications test equipment, fibre test equipment, audio and acoustic measurement, antennas and a wide range of specialist test and measurement equipment for immediate hire, Australia-wide. Measurement Rentals offers a wide range of test and measurement equipment at daily, weekly and discounted monthly rates. Please visit www.measurementrentals.com.au for more information.